In comparison to acrylic partials, SunFlex® partial dentures are lightweight, more comfortable and practically invisible. They offer the perfect degree of flexibility, providing maximum retention, stability and aesthetic appeal. They are also the easiest flexible partials to adjust in-office. These advantages make SunFlex® one of the finest solutions in partial denture treatment available today. SunFlex® is a pressure-injected, flexible denture base resin that is ideal for partial dentures and unilateral restorations. The resin is biocompatible nylon thermoplastic with unique aesthetic properties. SunFlex® partial dentures are not ideal for immediate dentures as soft liner and tissue conditioner do not adhere to SunFlex® material. The metal-free, flexible SunFlex® Partial provides a fully functional, yet aesthetically superior, removable partial denture. The unilateral SunFlex® restoration provides an aesthetic, functional design alternative to conventional cross-arch partial dentures. Also can be used as an implant temporary healing. The SunFlex® partial denture can also be used with cast metal frameworks for natural-appearing aesthetics. The combination of the cast metal framework with SunFlex® provides enhanced stability for cases with free end saddle. SunFlex® Partials are one of the finest solutions in partial denture treatment available today. Thousands of dentists and patients around the world have made the switch. Denser than other flexible partials, SunFlex® has the perfect degree of flexibility, is stain-resistant and does not discolor, warp or become brittle, providing maximum retention, stability and aesthetic appeal. SunFlex® is an excellent implant temporary partial and can be used as a bilateral or unilateral denture. For cases with a free end saddle or where the anterior teeth are missing, it can be used in combination with metal-framework for enhanced stability. If necessary, SunFlex® chair side adjustments can be easily made with tools that were especially designed for the SunFlex® nylon thermoplastic resin (figure 1). Teeth and clasps can be added to the partial at a later time without demarcation lines and it can also be relined or re-based in the lab. 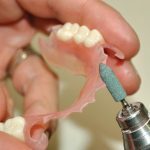 Understanding the distinctive features of SunFlex® in comparison to other partial dentures, and how they translate into preparation procedures and adjustment techniques, is vital to the success of a SunFlex® case. SunFlex® translucency readily adapts to a variety of natural tissue shades and is available in 4 different tones. Complimentary shade guides are provided upon request. The best type of impression material to use is alginate. The powder should be gently stirred from the bottom of the container to the top to redistribute the heavier elements that control shrinkage in the impression. Immediately prior to inserting it in the patient’s mouth, immerse the SunFlex® partial in very hot tap water for approximately two minutes. 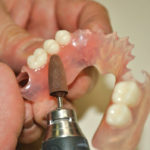 Once the partial has cooled to a tolerable temperature, gently insert it into the patient’s mouth. This first step is very important as it allows for a very smooth insertion and a good adaptation with the natural tissues in the mouth. In case of clasp tightness, it may be loosened slightly by being immersed in hot water for 30 seconds and bent outwards while underneath cold tap water. If a clasp requires tightening, follow the same procedure, bending it inward. If further adjustments are necessary after insertion, the SunFlex® Tool Kit is recommended. The cross cut carbide burr is used to grind down edges if needed. For effective reduction of the periphery edge, relief in tissue-contacting areas and to ease tightness or difficulty in insertion and removal, use the green silicone-carbide abrasive point, which permits fine adjustments to be made with a minimum degree of roughness on the surface. You may also use the green & brown rubber point. Set your hand piece on the lowest speed and use fast, light scraping back and forth motions to reduce the area, continuously varying the contact point. Too much pressure may burn or distort the restoration. After reducing the area, use the brown rubber point at slow speed with rapid back and forth movements to rubberize, smooth and pre-polish the surface. Note that fibers that appear during grinding can be removed with a very sharp blade. No tooth preparation is required, just send to the laboratory a master cast poured promptly and carefully from an alginate impression, along with opposing model and bite registration. Re-polishing is often not necessary when the Green Point is used properly. If necessary, it can be done with Coarse Pumice and Brown Tripoli using a soft rag wheel. A high luster can be restored to the surface using an acrylic-polishing compound following the Tripoli application. All tooth, clasp, or saddle additions must be completed in the laboratory using SunFlex® resin. Make sure the base of the partial is completely clean. Take an alginate impression with the partial in place in the mouth, pour up immediately and send to the laboratory with instructions. Relines are relatively infrequent with SunFlex because of its ability to adapt to the subtle changes in the mouth. If a reline is indicated, simply remove all adhesives from the tissue side of the partial and take a rubber base wash impression in a closed mouth position. Then take an alginate pickup impression, pour immediately and send to the laboratory. Do not separate the partial from the model. The partial will be jumped into a new base by your lab.